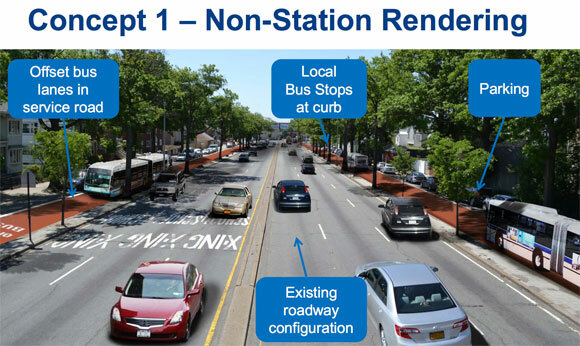 NYC DOT and the MTA have developed three design concepts for Select Bus Service on Woodhaven Boulevard and Cross Bay Boulevard in southeast Queens, and two of them go further than previous SBS routes to keep cars from slowing down buses [PDF]. All of the options include some measures to shorten crossing distances for pedestrians on one of the city’s widest and most dangerous streets. The Woodhaven SBS project, which covers a 14.4-mile corridor running from the Rockaways to Woodside, is the biggest street redesign effort in NYC right now. All the City Council members along the route have said they want big changes, and the concepts on display last night indicate that DOT and the MTA can deliver. Agency representatives showed the three designs at an open house in Ozone Park where residents could leave written comments on posterboards. City Council Member Eric Ulrich told me he liked what he saw, and bus riders and transit advocates were especially keen on “Concept 2” and “Concept 3,” which would create clearer paths for buses. Here’s a rundown of how each option would work. Concept 1 is the closest design to previous SBS routes, with buses running in an “off-set” lane removed from the curb by a parking lane. At intersections, the sidewalk would widen at bus stops, and an island in the center refuge would cut crossing distances in half. On some blocks, between intersections, a concrete divider would separate the bus lane from through traffic. While this would keep some cars from violating the bus lane, it would also mean buses would share the lane with vehicles accessing the curb. 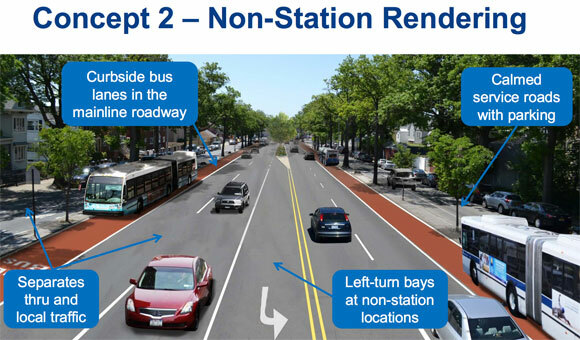 In Concept 2, the buses would run in a dedicated lane next to through traffic, not on the service road. 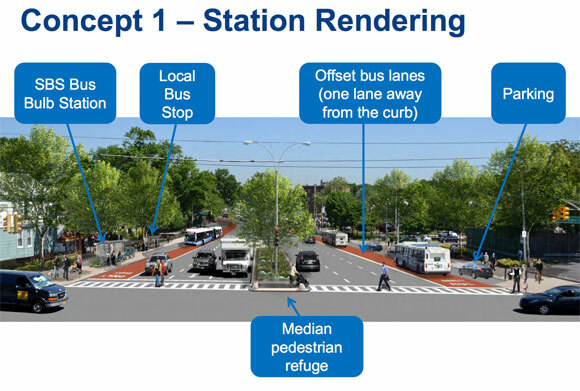 This would keep deliveries, parallel parkers, and turning vehicles out of the path of buses — a significant step up from current SBS routes that run next to the curb or in off-set lanes, which leads to conflicts between buses and vehicles accessing the curb. This design also includes two pedestrian islands at intersections, cutting down on crossing distances. Concept 3 puts the bus lanes in the center of the street, minimizing potential interference from car traffic. Since the MTA would not be purchasing left-door buses to run on this route, bus stops would not be on a center median but instead to the right of the bus. 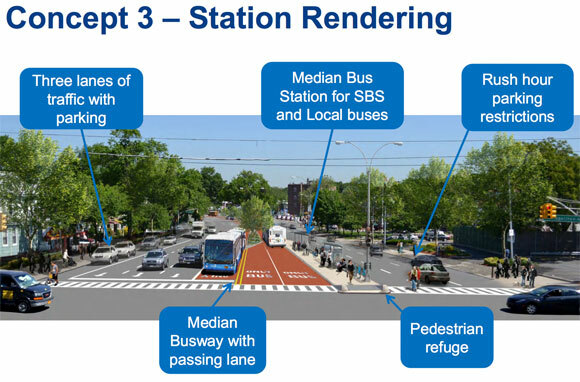 Because this design calls for a passing lane where SBS buses can pass local buses, not as much street space is set aside for sidewalk extensions and pedestrian islands as in the other two designs. 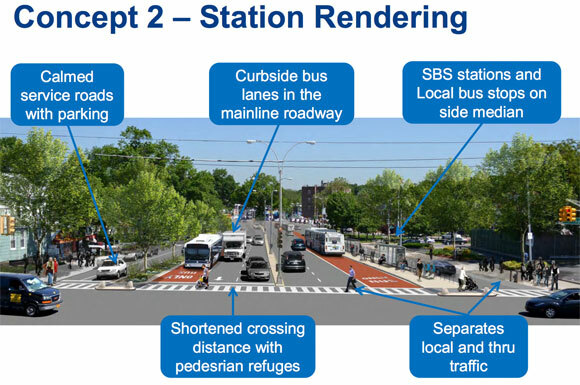 All of the concepts include the standard suite of SBS features like off-board fare collection and enable local buses to use the dedicated transit lanes. They all include three general traffic lanes in each direction as well. Woodhaven and Cross Bay are currently a jumble of different configurations, with a confusing array of service lanes and concrete medians that shift along the route. Concept 1 would involve the least amount of change to the existing roadway and could be implemented the fastest. The other two designs would entail tearing up more of street and would take longer to build out, potentially stretching into 2017. Ulrich, who has emerged as a big supporter of the project, said Concept 1 would be the easiest for his constituents to digest but was also intrigued by Concept 3. If bus stops can safely be located on islands in the street, he said, he could get behind the center-running bus lane design. The transit advocates and bus riders in the audience last night saw more appeal in Concept 2 and Concept 3. Joan Byron of the Pratt Center for Community Development said that at first blush, Concept 2 looks like the best choice, combining good separation for bus traffic with calmer service roads that, while lacking bike lanes, would not be terrifying to bike on. Emily December, 23, a student at Queens College who takes the bus from her home near Atlantic Avenue, agreed that Concept 2 looked the safest. Drivers frantically shifting lanes are a major problem on the corridor, she said, interfering with all traffic, including buses, and she thinks Concept 2 would be the best way to impose consistency and order. She also preferred the location of bus stops in that design, which would drop riders off next to a service lane instead of a through lane, as in Concept 3. Last night’s open house was the latest in a series of public meetings DOT and the MTA have held on the project. Detailed designs, including tough problems like how to deal with pinch points where the roadway narrows, have yet to be hashed out. The next step, said DOT’s Eric Beaton, is to take these three rough concepts and start laying them out on a block-by-block basis. Expect to see the next iteration of the project designs early in 2015. The debate about whether people get dropped off in the center or along the service road doesn’t make much sense. Even in the current curbside bus service, roughly 1/2 of all people who get on or off a bus have to cross the ENTIRE street. Center-stations work fine all around the world. I expect better from Joan Byron. Has she not seen the plethora of examples of good BRT? Do any of them have a configuration of Concept 2? What no one has mentioned is that center-running bus lanes (Concept 3) have fewer conflicts with turning vehicles, since they only cross paths with left turning cars. In Concepts 1 & 2, buses conflict with BOTH left and right-turning vehicles, adding significant delay to bus movement, and creating more opportunity for collisions. Why are we reinventing the wheel here? Why not go with a layout that has been proven to work well. Also not discussed is why we prioritize a high level of car movement, at the expense of ped and bus improvements. Why can’t we have BOTH center-running bus lanes AND a service road configurationb that prioiritizes the ped environment? The answer is that DOT/MTA has decided that moving cars is more important. 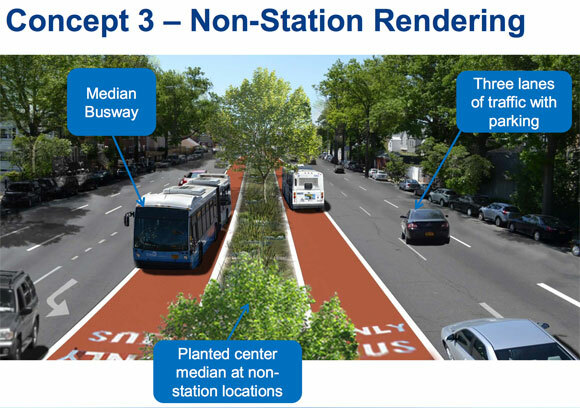 Since MTA/DOT has made the very concept of whether or not this will be BRT up for debate, shouldn’t the ladder of priorities be up for debate as well? My understanding is that there would not be right turns across the bus lane at intersections in Concept 2. All right turns would be made from the service road, which could be accessed from slip lanes, and that would involve drivers merging across the bus lane. Is the passing name necessary? Are buses so frequent that the professional drivers cant be trusted to temporarrily use the opposite lane to pass? How do cyclists riding in the service lane / local traffic street turn left onto a perpendicular street or vice-versa? I understand that a green wave for buses (stopping only at bus stops) makes the same for cycling difficult or impossible. Passing lane for express buses that operate on a different schedule. Also have you ever seen when buses bunch up? Hopefully this will alleviate bunching and keep all lanes happy. 3 for sure. And Woodhaven is scary for bicyclists for most of its length. Even I prefer to find alternate routes. I think it is likely cyclists in the area try not to use Woodhaven. Traffic light preemption? All the rest seems almost pointless if all it might do is let buses speed unimpeded, only to be stuck at the next red light. It’s high time traffic signal preemption was the norm for buses in this city. A bus carrying upwards of 50 people should definitely have priority over everything else except emergency vehicles. And yeah, concept 3 without a doubt. Yes, signal priority for buses is part of the standard SBS package and will be included. Thanks Ben. That’s certainly good news. The final design here should fill a major gap in public transportation. The thirty minute variability in run times isn’t because the buses sometimes hit extra red lights. There’s real value without buses being able to hold a green. Do locals use the bus lane too? Or do they stay on the curb? A big difference between NYC and most of the international and US cities that have done BRT is that lots of the “world-class” examples operate completely apart from any existing local service. If the classic BRT configuration (center platform stations and left-hand door buses) has to be modified to work here, I’d argue that needing to integrate with a robust local bus network is a good problem to have. What about option number 4. Take option one, put a bike lane directly to the left of the bus lane. A pedestrian island with concrete curb is then located directly to the left of the bike lane. The parking lane is then to the left of the concrete island. Add right turn lanes in the through traffic lanes next to the parking lanes. Split phase signals give green lights when a bus is present. When. There is no bus present, right turn signal gives right turning drivers a green arrow for a portion of the regular green phase. This would give buses and cyclists no interactions with turning vehicles and pedestrians so not have to cross any traffic lanes to get to the bus stop. While a commenter below mentioned that half the ridera must cross the entire street, better to have some pedestrians crossing the entire street than all pedestrians crossing half the street. While it is inherently more dangerous to cross the entire street than half the street, I am sure that, statistically, it is less dangerous to have fewer actual people crossing the street. I’d think that’s desirable because (1) there still seems to be an insane amount of space dedicated to cars in those renderings (2) and I suspect the lack of car traffic they convey is a bit misleading. Having buses be required to leave the lane to pass other buses would likely bungle things. Sorry, that won’t happen until New Yorkers are willing to sacrifice parking spaces in the name of safety. Locals use the bus lane in each of these options. None of the options have physical separation? Not even a curb? This DOT is paint-obsessed. Love it, nice work dot. I like number 2: only two driving lanes (non-local) for cars. Beautify islands too, pls! Option 1 has semi-physical separation. Some parts are, some parts are not. But the stupidity of it is anyone looking for a parking space would need to use the bus lane exclusively until they find one. And therein is the majority of the excuses for drivers ticketed for bus lane violations. But hey, that’s why I like my proposal below. I agree with Council member Eric Ulrich on using option one which is the easiest to implement. By doing so the money can be spent to also update middle center medians, updating bus stops along the route, maximizing the sidewalk curb for the more customers and keeping street parking which is beneficial to the residents and the business community.I also think the DOT/MTA should highly consider making a hole on each side of the bridge between Union Turnpike and Metro Ave for a one lane bus/emergency vehicle lane which will allow buses and emergency vehicles to get ahead of the traffic on the bridge. No bike lanes while 6-8 moving car lanes remaining? Flabbergasted. Interesting. Did they have an example of where this setup has been tried successfully? Eric Beaton said some sections of Pelham Parkway in the Bronx have this configuration and it’s worked well. Did they speak about the section of Woodhaven Blvd where it crosses train tracks on a viaduct between Metropolitan Ave and Union Turnpike? The service road doesn’t cross the rail tracks, so essentially its only 3 lanes in each direction. The merge from multiple lanes to 3 (including a left turn option southbound at Union Turnpike) is probably the biggest cause of traffic on the entire corridor. I’ve always felt that any bus plan needs to address this specific subsection, otherwise traffic buildups will be inevitable. well, after seeing the PDF with design concepts, I must admit that Concept 3 is really great with local bus service vs SBS. sill don”t like 6-7 lane ped crossing. in my country, max 5 lanes is allowed per one crossing… there must be a ped refuge/island. Found someones vid of a stop there..
First Phase of Woodhaven Bus Upgrades Coming This Fall. Then What?